20% Off NYT Advice & Misc. PLEASE BE AWARE: This data base is for the TRAVERSE CITY store only. Not every searchable book on this site is in our store's physical inventory. Please check the book's availability line for verification. From the #1 New York Times bestselling author, reach your goals with this pocket-size inspiration and guidance to keep your transformation on track. For anyone who has ever had trouble staying motivated while trailblazing towards badassery, You Are a Badass Every Day is the companion to keep you fresh, grateful, mighty, and driven. In one hundred exercises, reflections, and cues that you can use to immediately realign your mind and keep your focus unwavering, this guide will show you how to keep the breakthroughs catalyzed by Sincero’s iconic books You Are a Badass and You Are a Badass at Making Money going. 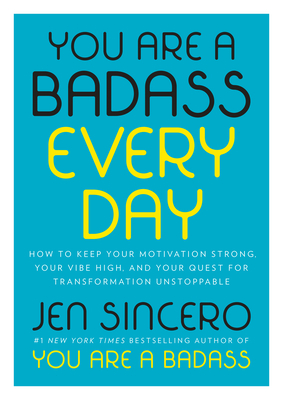 Owning your power to ascend to badassery is just the first step in creating the life you deserve—You Are A Badass Every Day is the accountability buddy you can keep in your back pocket to power through obstacles, overcome the doubts that hold you back from greatness, and keep the fires of determination roaring while you reach your goals. Jen Sincero is a world-renowned author, success coach, and motivational speaker who's spent over a decade helping people transform their lives and their bank accounts. See if your favorite author is coming!